On the face of it, this is just another modern undistinguished church building on an undistinguished housing estate, and including it on this site is the kind of thing that gets me accused of being trainspotterish. In my defence, I must tell you that there is rather more going on here than meets the eye. If you have ever been to Bury St Edmunds, especially on a Saturday morning, there is one question that you always end up asking. As you force your way through the crowded Market (Suffolk's biggest and finest) or rub shoulders in Sainsbury's or M&S, or thread through the tightly packed lanes with their posh little shops, it will eventually occur to you to wonder: where do all these people actually live? Decent vernacular architecture in north Bury: a Church on a mission. Bury may claim a population of barely 50,000 souls, but it always seems much bigger than that. Well, one answer to your question is that they live in Moreton Hall - or, at least, 10,000 or so of them do. This is the vast new estate that spreads to the north of the River Lark, safely hidden from the pretty town centre (as all Bury's estates are). You get to it by heading off of Angel Square on the Ixworth road, over the bridge, turn right, and there you are. Moreton Hall is what is known as a 'planned community' of the 1980s and 1990s, making it rather better than earlier housing estates or unplanned ribbon developments. It is actually rather pleasant - certainly much more comfortable than Bury's southern housing estates, which cluster around the sugar beet factory, and are cut off from the town centre by the A14. It is, like many planned communities, designed for easy access by car, but with lip-service at least paid to cyclists. Cycle lanes seem to wind their way around the estate with enthusiasm, but the lack of adequate signposting meant that they were fairly useless to me, and I stuck to the roads. Christ Church is a yellow-brick building in the Suffolk vernacular style. It sits on a square corner beside the Bury park and ride and a small supermarket. It is just off of the main road through the estate, but its setting across a wide verge from some pleasant semi-detached houses gives it a villagey feel, and not an urban one at all. The tall windows echo Suffolk Perpendicular, as do the rather neurotic buttresses. We have met this idea before at St Francis and, more traditionally, St Augustine, both in Ipswich. Unusually, the main block is almost all a big, light nave, without the fussy offices packed in around that we find at Cavendish Community Church. These are restricted to the west end, with an annex to the south west of that. The south west corner of the church; the extension contains offices and meeting rooms. The large car park is to the left, out of picture. Christ Church is the Anglican Parish church for the Moreton Hall estate. And yet, it isn't. Or rather, it is, but it is also rather more than that. On the church website there is a document entitled The Declaration of Ecumenical Commitment. This document gives something of the history of this extraordinary church. It all began back in the early 1980s. At that time, we learn, the church was planted by a single group of Christians from different denominations at the instigation of the Council of Churches for Bury St. Edmunds, with the consent of the vicar of St. Mary's. Separate groups of Christians did not gather together to form a new Church. It has always been envisaged that Christ Church, Moreton Hall, would be a single body working ecumenically in the clearly defined mission area of Moreton Hall Estate. Obviously, I could have got away with paraphrasing that lot, and made it look like my own work. But I think it is important for us to see exactly what this church community says about itself, if we are to have an insight into how singular it is. What we have here, then, is an inter-denominational church. Or do we? Would it be more accurate to say that it is non-denominational? And I had assumed that the bit about the permission of the Vicar of St Mary's was one of those typically Anglican pieces of legalese. But when you look a little deeper, you see that things are a little more interesting. 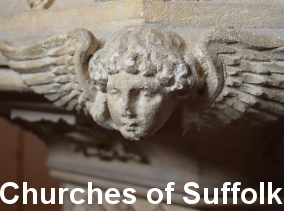 The document continues: Moreton Hall Estate has been designated a mission area by both the [Anglican] Diocese and Churches Together in Bury St. Edmunds and District and recognised as such by Suffolk Churches Together. Those of you who have come across Churches Together will know what an excellent organisation it is. It has always grieved me that it doesn't exist in Ipswich, and I am really excited that a new group is currently under discussion there. It works very well in other places in Suffolk - the Waveney district, for instance, and Felixstowe. And apparently Bury. The Catholic church is very strongly involved in the Churches Together movement - indeed, along with the Baptists they seem to be the main driving force in many places! The concept of being a new mission Church is a powerful and unifying feature in the character and self understanding of the Church members, continues the document, which I thought rather wonderful. 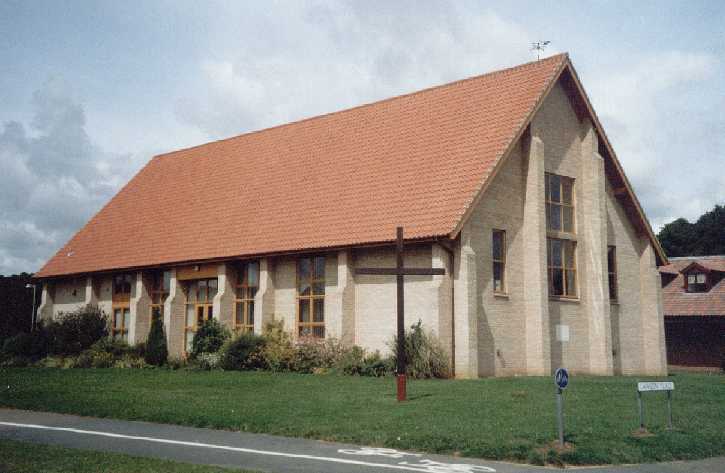 But then, my nagging doubt begins to nibble into the picture again: On 1st July, 1994, the Parish of Christ Church, Moreton Hall, was created from the parishes of St. James's, St. Mary's, Holy Innocents Great Barton, and St. Mary's Rougham. St. Edmundsbury Borough Council made land available on generous terms on the understanding that the building erected could be used by every Christian on the estate and that Anglican rites of passage will be performed there. Just read that last sentence again. Does that not strike you as a little extraordinary? Further, as an Anglican parish the incumbent will always be an Anglican. The appointment is in the hands of the Board of Patrons: they are the Diocesan Bishop, the Vicar of St. James's (Provost) and the Vicar of St. Mary's. It is hoped that this body will consult widely when advertising and offering candidates to the Parish. The west end, from the car park. Notice the cycle racks - how civilised! Now, I am fully aware of the Anglican church's special position as the Established church, with its Bishops sitting in Parliament, and the Government of the day overseeing major appointments. But is this really the kind of level playing field that encourages ecumenism? And then my doubt bites home: Churches Together in Bury St. Edmunds and District, Suffolk Churches Together,and the Diocese of St. Edmundsbury and Ipswich have sought to ensure that Christ Church was the only fully recognised Christian presence on the estate, so that its ecumenical work would not be diminished. 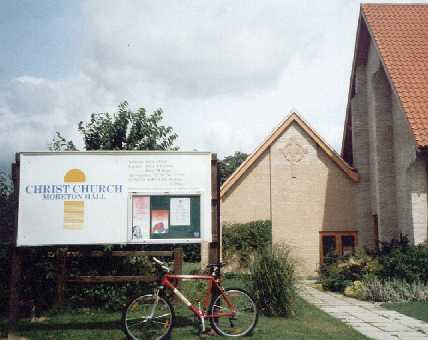 Christ Church, Moreton Hall, is recognised as being a Local Ecumenical Partnership while remaining an Anglican parish. Well, make what you will of all that, I suppose. The declaration is signed by the Anglican Bishop, as well as representatives of the Baptist Union, the Savation Army, the Methodist Church and the United Reformed Church. 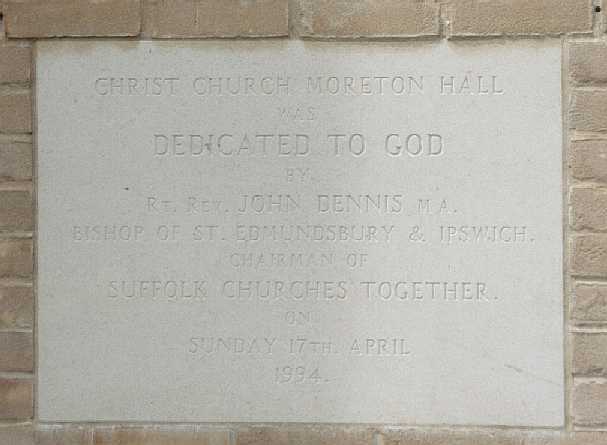 On the east end of the building is a plaque, showing that the building was opened on 17th April 1994 by the chairman of Suffolk Churches Together - who just happened to be the Anglican Bishop. As a member of Suffolk Churches Together, I suppose that the Catholic Church must have agreed to all this. Judging by St Edmundsbury Council's conditions, they are entitled to use it for Masses, but I could find no evidence that this happens, so it looks like the Catholics of Moreton Hall have to travel into St Edmund in the town centre if they want to go to church. This all sounds as if I'm carping, and I don't mean to be. I wish Christ Church every success, and hope that it succeeds in its Evangelical Mission. Anything that brings people to Christ is doing good work, and I assume that this partnership will ensure an equality of opportunity for all the traditions involved in it. 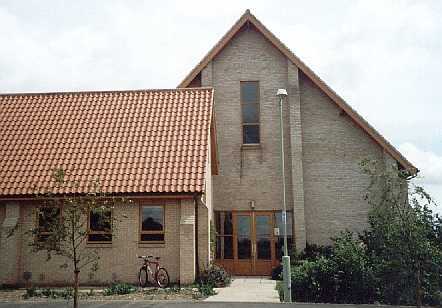 Christ Church, Moreton Hall, is located in the northern suburbs of Bury St Edmunds. Take the road that runs from the north of Angel Square, over the bridge, and turn right. I expect that it is only open when in use.